Where does a warrior go when the Cartoon Wars end? He grabs his sword and sails across the sea to find new stick figures to kill in Cartoon Wars: Blade. Available today on iTunes, Blade is another side story in Blue GNC's epic sketchy war franchise. While Cartoon Wars 1 & 2 were defense games, the latest installment is an action game in the vein of Cartoon Wars: Gunner. 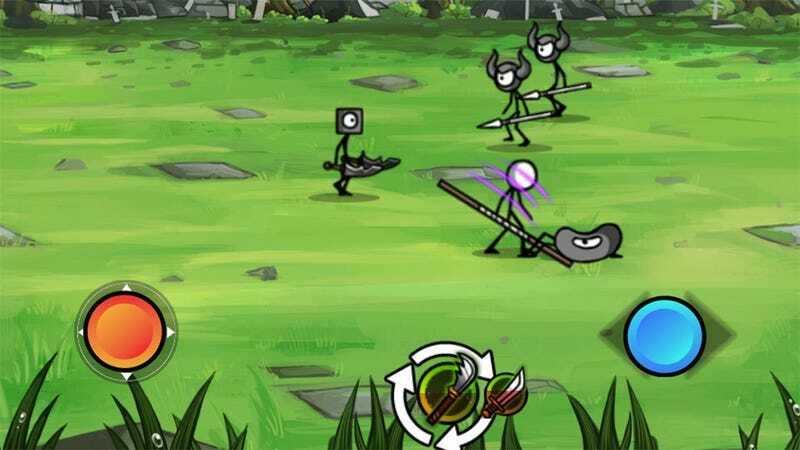 The player maneuvers the stick figure hero about the field, unleashing sharp-edged justice against waves of heavily-armed foes. Earn money to upgrade weapons, purchase stat-boosting helmets (I am gunning for the bunny hat), and repeat until you find something better to do, which isn't as easy as it might sound. Gamevil made a lovely video explaining how the game works, and you can certainly waste six minutes watching that instead of heading directly to the App Store and spending $.99 if you so desire.